b) Save yourself the trouble by taking your computer somewhere and shooting it. To begin with, most of us have absolutely no idea how a computer works. This is illustrated by the fact that, when there’s a problem, we get really mad and yell at the monitor. This is sort of like yelling at the refrigerator because the container we thought was “Cool Whip” actually turned out to be refried beans left over from last year’s Cinco De Mayo party. The fact is, refrigerators and computer monitors are just boxes filled with stuff coming from somewhere else; over time, improper maintenance can result in something that really stinks. You see! If I take a piece of aluminum foil and touch this part to that shiny blob over there I can AAAAAGH! 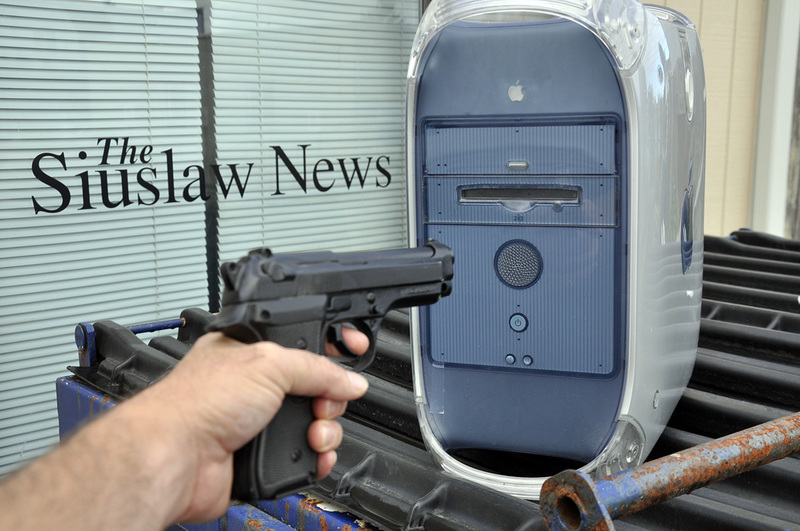 You guessed it: People shooting their computers. No. Actually, according to a nationwide survey of 1,300 computer technicians, most computer malfunctions were caused by things like food, dead rodents, cockroach nests and, in the case of one Pittsburg, Calif., technician, “a stash of marijuana” that mostly effected the computer’s memory. This brings us to how to clean your computer. You will need an antistatic wrist strap, a can of compressed air and, if at all possible, a drug-sniffing dog. Once you have these items, you can remove the housing from your computer and use your antistatic wrist strap to begin cleaning. Depending on what you find inside, you can utilize the alligator clip attached to the wrist strap as either 1) a conductor to keep static electricity from discharging into the sensitive internal circuitry of your computer, or 2) a way to keep from burning your fingers. Once this phase of cleaning has been completed, use the can of compressed air to blow out particles in some of those hard-to-get-to places — such as the nostrils of a drug-sniffing dog. Repeat this process at least twice a year or, depending on your situation, as often as you’d like for the next 3 to 5 years. By then, of course, it will be time to get a new computer.